Nephro-Urology Monthly - Is Radical Nephrectomy for Patients with Kidney Tumors a Risk Factor for Chronic Kidney Disease? To Cite: Nourbala M H, Ghadian A, Rostami Z, Abbaszadeh S, Azarabadi M, et al. Is Radical Nephrectomy for Patients with Kidney Tumors a Risk Factor for Chronic Kidney Disease?, Nephro-Urol Mon. 2017 ; 9(6):e13105. doi: 10.5812/numonthly.13105. Background: Patients who undergo radical nephrectomy are considered as single kidney. In addition, most patients will develop CKD due to reduced kidney function. In this study, we monitored and compared kidney function results in patients with kidney tumors who had radical or partial nephrectomy. Methods: This cross sectional study was conducted on 129 patients who were admitted to hospital from 2007 to 2012. There were 122 cases that had a radical nephrectomy and 7 patients who underwent a partial nephrectomy. The CKD was defined as eGFR < 60 mL/min/1.73m2 and the readings at the 1st, 3rd, and 5th year after the surgery were followed up. Results: In the first year of the follow up, there were 0% and 19.2% (P = 0.3) of patients with eGFR < 60 ml/min/1.73m2 in the partial and radical nephrectomy groups, respectively, which was not statically significant. However, it was increased to 63% (P = 0.05) at the 3rd year of follow up in the radical nephrectomy group and there was no new CKD reported in the partial nephrectomy patients. At the end of the follow up, 14.3% and 71.3% of patients developed CKD (P = 0.003). Conclusions: Radical nephrectomy is a risk factor for developing CKD. Therefore, radical nephrectomy should only be considered if the size and location of the tumor are not suitable for a partial nephrectomy. Renal cell carcinoma (RCC) is responsible for 2% - 3% of all adult cancers and it has the highest mortality and morbidity rate among common urologic cancers. All T1 tumors were previously considered malignant and were treated by radical nephrectomy. However, this view has been changed in the past 2 decades (1). Radical nephrectomy is still considered as a preferred surgical procedure in patients with large localised RCC (many of T2 tumours) or in limited numbers of T1 cases where we are unable to save the kidney. Developing stage 3 CKD (eGFR < 60 mL/min/1.73m2) is more common following radical nephrectomy (65%) compared with partial nephrectomy (20%). The risk of sever CKD (eGFR < 45 mL/min/1.73m2) after radical nephrectomy is 36% compared to 5% following a partial nephrectomy. Different studies showed adverse effects of CKD (2, 3). CKD management is a very important nephrology referral and correct management can prevent or minimise anaemia, bone problems, and impotence in these patients. Many studies showed that radical nephrectomy has favorable oncologic outcomes, however, patients will be prone to CKD as well as cardiovascular disease and their morbidity and mortality will be increased (2, 4-7). The aim of this study was to monitor and compare kidney function results in patients with kidney tumors who had a radical or partial nephrectomy. In this study, information related to patients with renal tomors who were admitted to hospital between June 2007 and October 2012 were obtained. The tomor size, stage and grade, pathology, as well as other demographics were collected and recorded in the questionnaire. A kidney function test was performed by measuring blood creatinine test and subsequently calculating eGFR based on MDRD [GFR (mL/min/1.73 m2) = 175 × (Scr)-1.154 × (Age)-0.203 × (0.742 if female) × (1.212 if African American) (conventional units)] to evaluate the presence or absence of CKD (3, 8). 18 patients were excluded from the study since they passed away due to either renal complications or other causes before the end of the study. 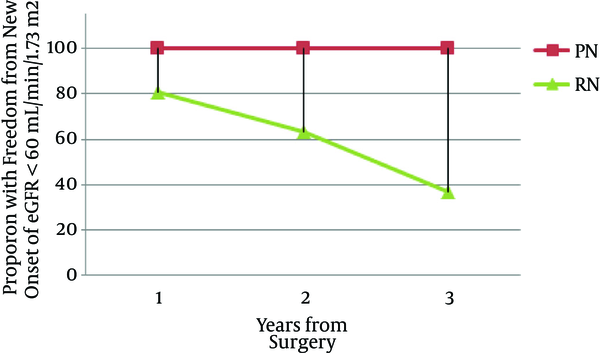 The duration between surgery and blood creatinin measurement were considered as the follow up period. However, the exact point of time at which eGFR were first affected was not clear and it is possible that some patients have had CKD before their status being assessed for the study. Therefore, the relationship between different variables with the eGFR level should be considered with caution. However, it is possible to confidently assume that patients did not develop CKD within a 1 - 3 year follow up. Data were analysed using the Chi-square, fisher exact test, and t-test. When it was not possible to use the Chi-square, the fisher test and P value were calculated. The patients were ranged between 3 to 96 years old and the average range of age was 56.5 (± 15.9). There were 129 patients in total, (85 (65.9%) male and 44 (34.1%) female. 4 patients (3.6%) had eGFR < 60 before the surgery but their eGFR were more than 60 in the follow up. There were 59 patients (53.1%) who had eGFR > 60 pre operation but the kidney function deteriorated in the follow up and their eGFR were recorded < 60 post operation. In general, there were 22 patients (19.9%) with lower eGFR before their operation and 77 (69.4%) participants who developed CKD post operation (Table 1). The mean age among patients with eGFR < 60 mL/min/1.73m2 was 59.29, with 46.35 in the other group. In patients who underwent partial nephrectomy, the mean age was 45.29, while it was 57.19 with P = 0.054 in radical nephrectomy patients, which was not statistically significant. In patients whose tumor size was less than 7 centimeters and had a radical nephrectomy, 66.7% had eGFR < 60 and it was 14.3% in partial nephrectomy group with significant P value of 0.01. eGFR of 82.9% of patients who had ≥ 7 cm tumor and underwent radical surgery were less than 60 mL/min/1.73m2. Overall, 73.1% of patients with radical surgery and 14.3% of partial nephrectomy group had CKD (eGFR<60 mL/min/1.73m2) (Table 2). In the one-year patient follow up, no one with partial nephrectomy developed CKD, however, 19.2% of patients developed CKD (P = 0.3). Results were similar in the 2nd year of the follow up (P = 0.5). However, in the 3rd year of the follow up, the percentage of CKD patients in radical nephrectomy group was increased to 63% compared to 0% in partial nephrectomy group with P value of 0.05 (Figure 1). There were 82%, 64%, 38%, 21%, and 3.8 of the total number of nephrectomy patients in the first, second, third, fourth, and fifth year of the follow up, respectively, who had eGFR > 60 mL/min/1.73m2. Patients who did not have enough number of follow-ups were excluded from the study. Radical nephrectomy is less popular for small tumors, and in order to avoid CKD, it should not be considered until absolutely necessary. The main issue after radical nephrectomy is the increased risk of CKD, then subsequent cardiovascular morbidity, and total mortality, which has been shown in different follow up studies after a radical nephrectomy (9). In a study done on 662 patients with a small single tumor and who underwent a partial nephrectomy, 26% of patients had stage 3 CKD, however, 19.9% (22 patients) were related to CKD before the surgery. Therefore it is important to assess patients for CKD before the surgery in order to provide better observation and monitoring for patients with known CKD. Studies also showed that this population differs from donor nephrectomy population (4, 10). Ibrahim et al. (2009) followed up with 3698 participants who had a donor nephrectomy for 9 - 12 years and showed that the risk of developing CKD in this population was not different from the normal population and their morbidity as well as mortality were less than patients who underwent aradical nephrectomy due to a kidney tumor, which were explained with the younger population age and lack of predisposing factors (10, 11). In this study, 73 patients had kidney tumors of less than 7 cm and 3 patients (radical nephrectomy) were excluded due to death. Radical nephrectomy was performed for 90% (63) and 10% (7) had a partial nephrectomy. Having eGFR > 60 in 33.3% of the RN group compared to 85.7% in partial nephrectomy indicates that many RN patients will suffer from CKD. Minato et al. studied 416 nephrectomy patients due to kidney tumors in Japan and compared the decrease in the kidney function of RN group with PN ones. They showed that RC was an independent risk factor for CKD and partial nephrectomy patients had experienced a minimal decrease in their kidney function, which was not statistically significant (12). Studies showed that RN increased the death risk among patients’ compared to PN, 3, 4 and cardiovascular mortalities were also increased (5, 6). It was also indicated that patients who undergo RN are at higher risk of developing CKD (6). In this study, we evaluated outcomes of 7 PN patients and 104 RN cases. 18 patients from the RN group were excluded from the study due to death. The percentage of low eGFR (< 60) were 14.3% and 73.1% in PN and RN patients, respectively, which was statistically significant and this outcome further confirms that RN patients are more prone to develop CKD and studies also showed that they cardiovascular morbidity and mortality will be increased in this group. Death was one of the end points and an exclusion criterion in this study. Therefore, 18 deaths were reported, which were all among radical nephrectomy patients and interestingly, there was no death reported in the PN group. However, a larger population should be studied to accurately assess CKD related morbidity and mortality. There were some limitations in this study including excluded patients for which we were unable to calculate eGFR. The study population for partial nephrectomy was very small and therefore results should be interpreted with caution. This is also another indication that providing information for surgeons on CKD risks following RN should be emphasized and therefor surgeons should be encouraged to consider partial nephrectomy where possible. RN is a risk factor for CKD and kidney function should be assessed in kidney tumor patients who are candidates for surgery. Radical nephrectomy should only be considered if the size and the location of the tumor are not suitable for a partial nephrectomy.